Antibodies are globular proteins or immunoglobulins that react specifically with antigen that stimulated their production. Depending on the electrophoretic migration rate, 3 types of globulins are present in the blood namely alpha, beta and gamma. Antibodies are gamma globulins. Antibodies account 20% of plasma proteins. 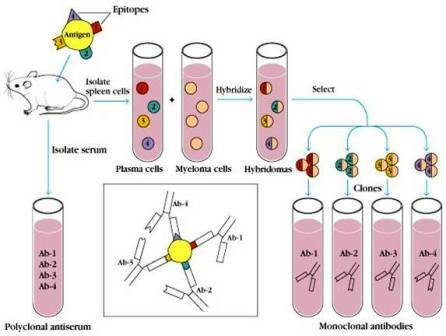 Monoclonal antibodies (MABs) are antibodies that arise from a single clone of cells. They are homogenous E.g. in a plasma cell tumour (myeloma). Monoclonal antibodies are highly useful in diagnostic tests and in research. Hybridoma technology developed by Kohler and Milstein has been widely used for the production of MABs. We will discuss the technology in next post. Multiple myeloma is a malignant disease responsible for overproduction of plasma cells (B cells). In this case the patient produce same type of immunoglobulin molecule (M protein) indicating the involvement of only one type of plasma cell. 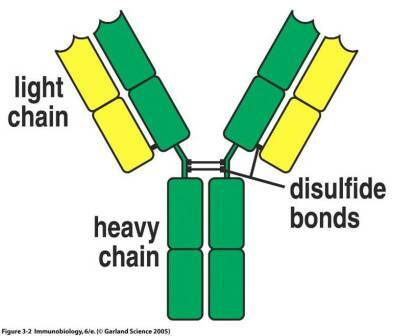 Immunogloubulins or antibodies are glycoproteins made up of light (L) and heavy (H) polypeptide chains. Light in the sense less number of amino acids (MW of about 25,000 Daltons), and heavy chain has a MW of 50,000-70,000 Daltons (more number of amino acids). 2 heavy chains (H-chains) and two light chains (L-chains) joined by disulphide bonds. Here the stem of Y is wholly formed by heavy chains and arms of Y have L-chain and H-chain running parallel to each other. L and H chains are further divided into variable and constant regions. The regions are composed of 3-D folded repeating segments called domains. Each domain is approximately 110 amino acids long. 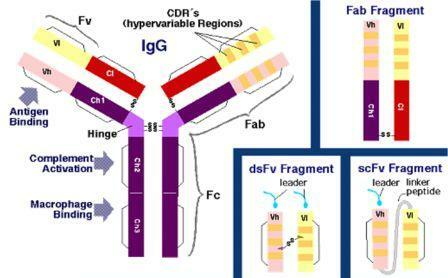 H chain consists of mostly one variable (VL) and three constant (CH) domains (IgG and IgA have three CH domains, whereas IgM and IgE have four CH domains). Hypervariable regions: The variable region of both L and H chains have three extremely variable regions at the amino terminal end that form the antigen binding site called hypervariable regions. Only 5-10 amino acids in each hypervariable region form the antigen binding site. The amazing specificity of antibodies is due to these hypervariable regions. Variable region is meant for antigen binding. Constant region is responsible for various biologic functions like complement activation and binding to cell surface receptors. L- chain belongs to two types k (kappa) or λ (lambda) on the basis of amino acid difference in their constant region. Both type occurs in all class of immnoglobulins (IgG, IgM etc), but one type in an immunoglobulin either k (kappa) or λ (lambda) not together. The amino terminal portion of each L chain is involved in antigen binding. H chains are unique for each of the five immunoglobulin classes and are designated ϒ gamma for IgG, α (IgA), µ (IgM), epsilon (IgE) and delta (IgD). The amino terminal portion of the H chain has the antigen binding site. The carboxy terminal forms the Fc fragment which is involved in complement fixation.